Exam centres this year have deployed metal detectors, facial and fingerprint recognition technology, cellphone-signal blockers, wireless detectors and even drones in their fight to root out cheating, media reported. A police officer monitors venues as students sit for China's national college entrance exam,Gaokao. 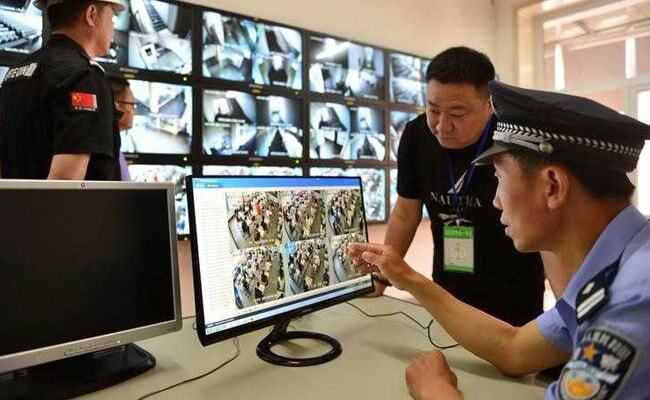 Beijing: Chinese education authorities have gone high-tech to catch cheaters as millions of high-school students take their "gaokao", the annual university entrance exam seen as key to landing a lucrative white-collar job. Even before the exam kicked off in earnest on Tuesday, security officers had arrested 52 people nationwide. Cheaters and their accomplices face up to seven years in jail. In Beijing, students this year had to write about either their vision of China in 2049, the centennial of the foundation of the People's Republic of China, or about relationships. Students in nine provinces were told to introduce China to foreigners using key words like "Belt and Road initiative", "bike-sharing", "high-speed railway" or "mobile payment", in a test of their knowledge of economic trends.